Math (and Physics) Professor Tevian Dray has been awarded the MAA University Teaching award. 2017 Deborah and Franklin Tepper Haimo Award for Distinguished College or University Teaching of Mathematics from the Mathematical Association of America (MAA), in recognition of his exemplary mathematics teaching and his positive influence on college mathematics curriculum development and teacher training on a regional and national level. See the IMPACT article below! Pavel Kornilovich’s “Physics in 2116” essay is a hit! Pavel Kornilovich is a runner-up in the “Physics in 2116” essay contest run by AIP’s “Physics Today”. Pavel’s essay, “African Arrow sees hints of structure in the fabric of space”, imagines the result of a giant accelerator experiment 100 years in the future that probes energy scale s at which the four known forces would be unified. Of about 200 entries, four essays were chosen for publication in the December 2016 edition of “Physics Today”. The other essays speculated about the implications of future technologies for privacy, emergent consciousness, and a future telescope, the “Asteroid Belt Astronomical Telescope”, built from polished asteroids. Happy reading! Pavel Kornilovich is a Courtesy Professor of Physics at Oregon State University and a Senior Technologist at HP Inc in Corvallis. 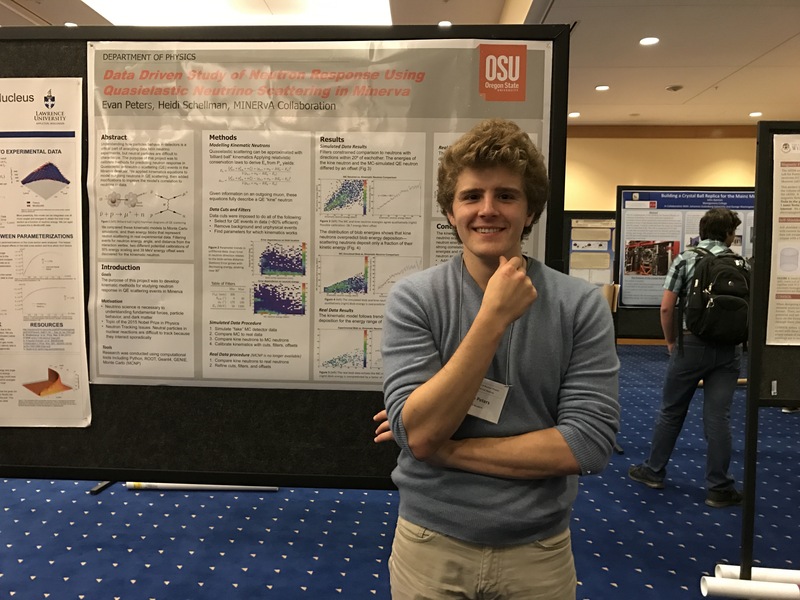 OSU’s Society of Physics Students chapter held an applications workshop on Saturday (11/19), where students got excited about summer internships, scholarships, and graduate school admissions. 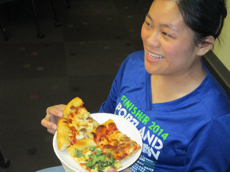 Beginning at 11:00 am, over twenty physics and science students passed through during the six-hour event to grab a snack and get to work. 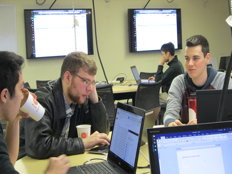 Supported by unlimited coffee and a pizza lunch provided by OSU SPS, students began the morning by sifting through lists of REUs and scholarships compiled by the chapter. As the afternoon came around, invited presenters arrived and shared their insights and experiences with students. Dr. Sujaya Rao, director of undergraduate research at OSU, discussed the URSA research program and ways to put together a stellar application. 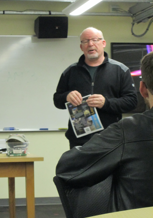 Dr. Randy Milstein from the Oregon Space Grant Consortium office discussed internship and scholarship programs at NASA and OSGC, and shared bios of OSU students who had been successful in the past. Finally, Dr. Janet Tate discussed career professionalism and how to get the most out of interactions with professors and professionals. Janet Tate talks about professionalism. 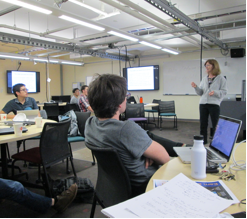 The workshop was successful in raising lower-division students’ awareness of research opportunities and getting students to think ahead about career-building opportunities—we hope to hold another one in the future! Physics Alumnus Steven Ellefson with with the ViewRay (the world’s first MRI-guided radiation therapy system) and the ArcCHECK-MR (a diode array used for radiation dosimetry measurements of complex therapy plans) that he worked on for his dissertation at UW Madison. Radiation Health Physics and a minor in Physics. 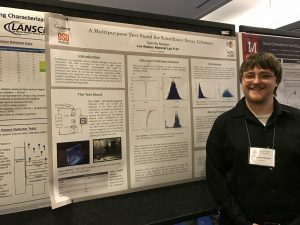 While at OSU, Steven did computational radiation physics research with Dr. Todd Palmer in the School of Nuclear Science and Engineering, completed a summer internship in medical physics at the Samaritan Regional Cancer Center, and was awarded the School’s Lower Division and Upper Division Student of the Year Awards in consecutive years. 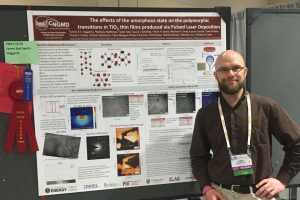 After graduation, Steven went on to the Medical Physics graduate program at the University of Wisconsin-Madison, where he focused on the physics of radiation therapy. 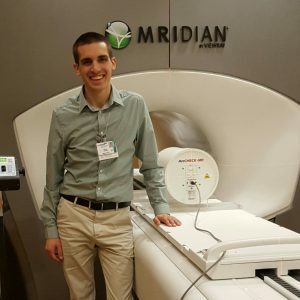 As a graduate student, Steven researched issues with using the ArcCHECK, a commercial silicon diode array widely used for radiation dosimetry of complex radiation therapy plans, for dosimetry on the ViewRay, the world’s first MRI-guided radiation therapy system. His research on the anomalous behavior of the ArcCHECK device under the influence of the ViewRay’s large magnetic field was presented at the annual conference for the American Association of Physicists in Medicine in 2015 and is currently under review for publication in the Journal of Applied Clinical Medical Physics. Steven graduated from the University of Wisconsin-Madison in 2016 with his M.S. in Medical Physics and, through a competitive application process, was chosen for the Medical Physics Residency Program at the Mayo Clinic in Phoenix, Arizona, which he is currently attending. Steven says the fundamental problem-solving skills and ability to think outside the box developed in the Physics program at OSU were essential to his success. He points out some special courses here. “K.C. Walsh and the general calculus-based physics sequence: Dr. Walsh made the fundamental concepts so easy to grasp and his enthusiasm is contagious. He was able to simultaneously encourage and challenge me to be a better physicist. He was also always willing to talk about interesting extracurricular physics problems and even try to work them out if a student requested (such as why a motorcyclist will turn into or away from a corner depending on the speed). Posted in Alumni, Research, Students, Undergraduates. Prof. Bo Sun and student Amani Alobaidi’s work on 3-D tumor modeling technology has been highlighted in an article in Advantage-Impact. A new 3-D tumor modeling technology could drastically change the way cancer is treated. Diskoid In Geometrically Micropatterned Extracellular matrix (DIGME) is a tissue-patterning solution that uses a low-cost device to control the shape of tumors — as well as the directionality and rigidity of their surrounding matrix — to stop cancer cells from spreading. Bo Sun, an assistant professor of physics in Oregon State’s College of Science, says DIGME will help doctors test their own cancer treatments and create new ones. And it could even improve the efficiency of early cancer detection. Sun’s device can facilitate development of new cancer treatments by better mimicking the physiological condition of tumors. 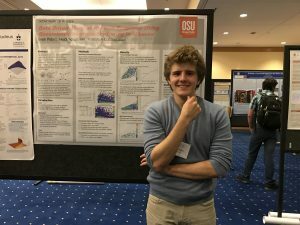 Oregon State University has filed for a patent and is looking for potential licensees and research collaborators to further develop the technique. In order for a cancer cell to dissociate from the main tumor and spread — also known as metastasis — it must dig a hole through the extracellular matrix (ECM). The ECM is the area that surrounds a tumor, which is made up of connective tissues like collagen. It can act as a barrier to keep tumor cells in or out, depending on its porousness. For example, an ECM that is very porous provides a soft environment for cancer cells to easily squeeze through and enter other areas of the body. An ECM that is very rigid, on the other hand, provides a barricade that is very difficult for a cancer cell to dig into. However, a rigid ECM also promotes tumor growth; therefore the relationship between ECM and cancer is anything but simple. This relationship is one of the central problems of cancer research. Sun’s team worked with standard cancer cell lines in the lab. To shape a tumor, a micro-fabricated stamp is used to create a mold made of collagen. Tumor cells are then suspended in a collagen solution and poured into the mold. The liquid collagen turns into a gel and links to the mold. The device can precisely control the location and rotation of the stamp, creating an exact shape. Different tumor shapes equal different clinical outcomes for patients, Sun explains. If a tumor has very high curvature corners, these sharp corners are more likely to become cancer stem cells, which are very invasive and lead to metastasis. Directionality is an equally important factor. The ECM — which is covered in polymer fibers — can be rotated with the help of DIGME technology. When the ECM is polarized — or given positive and negative charges — the orientation of those fibers can be rotated circularly, preventing additional cancer cells from disconnecting and spreading throughout the body. Controlling the shape and directionality allows DIGME to create challenging environments for cancer cells, testing their adaptability and understanding how they respond to treatments in complex physiological conditions. Sun’s research began with the goal of determining how tumors migrate and communicate with one another. Two-and-a-half years later, DIGME has the potential to help save lives. For licensing information, please contact Jianbo Hu at jianbo.hu@oregonstate.edu or 541-737-2366. This figure shows a breast cancer cell. (A) DIGME consists of a diskoid – a tumor cell aggregate whose shape is tightly controlled. The example shown in A is a hexagonal diskoid of monolayer thickness. Typical diskoid thickness can range from one to five cell layers. (B) A triangle diskoid of MDA-MD-231 cells (green) in collagen matrix (labeled with fluorescent particles, blue). Top: top view. Bottom: side view. (C) A MDA-MD-231 diskoid (green) surrounded by two layers of collagen matrix with different concentrations (1.5 mg/ml, red and 3 mg/ml, blue). Top inset: the diskoid invasion into the surrounding ECM after five days. Bottom inset: confocal reflection imaging showing distinct fiber microstructures across the interface of two collagen layers. (D) A MDA-MB-231 ring diskoid with its sounding ECM circularly polarized. The configuration mimics the ductal carcinoma in vivo. Scale bars: 200 μm. Posted in Faculty, Graduate Students, Research.